"Mystery of the Girls with Red Hair"
"Cloud City" is the 24th Mandrake Sunday story. The story was written by Lee Falk and drawn by Phil Davis. 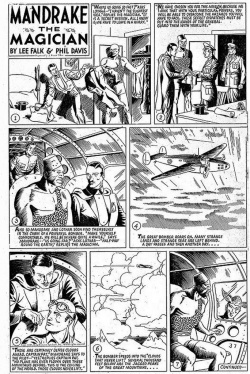 Mandrake and Lothar find themselves in a cabin of a powerful bomber. Our magician have been chosen for a secret mission, to put some secret dispatches in the hand of the general. The second day in the air they reach the great mountains. Flying in dense clouds over the vast mountain range the plane suddenly turns topsy-turvy. Grak, prehistoric giant birds. like flying sharks. At the deepwoods.org index the title for this story is "Cloud City", which is lifted from the plot. This page was last edited on 28 May 2016, at 10:14.